provided free of charge ($1,250.00 cost) by the nonprofit organization, “The Spirit of the Blue Foundation.” Along with basic first aid training and lifesaving measures such as quickClot, tourniquets are a simple, yet invaluable tool that can be quickly applied to save a life on scene when seconds count. 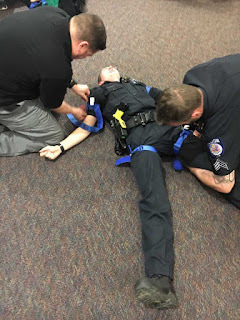 The tourniquet training was provided free of charge ($1,500.00 cost) by John “Brad” Gilpin, President of FDL Group; a company that specializes in tactical first aid training of first responders. The Spirit of Blue Foundation 501(c)(3) is based out of Rochester, NY and is dedicated to the enhancement of officer safety and vitality throughout the law enforcement community by promoting public awareness for their protection and fulfilling safety equipment and training needs. The Spirit of Blue Foundation develops and executes fundraising campaigns nationally with the support of partner non-profits, national retailers and safety equipment manufacturers. Fundraising proceeds are distributed in the form of Safety Equipment and Training Grants to law enforcement agencies across the country from local to federal levels. Since 2011 the Foundation has awarded 87 grants in 35 states.